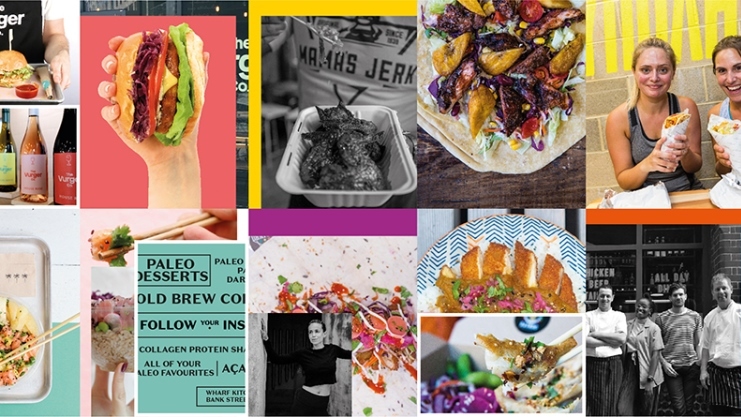 Wharf Kitchen, London’s newest independent street food market, has opened its doors, offering an eclectic mix of food and live DJ sets created to satisfy every palate. Situated in Jubilee Place, the vibrant new food hall offers diners a choice of cuisines from across the globe. Traders have been hand-picked for their innovative menus; whether diners are after soul-satisfying burgers packed with plant-based goodness from TheVurger Co, free-range fried chicken elevated to a new level at Bird, or Ahi Poke’s signature bowls filled with raw sunshine ingredients, those on a culinary quest for something different will be spoilt for choice. Also opening its doors in the market is The Athenian, redefining Greek gastronomy across the capital, Rainbo serving up flavour-filled gyoza at its best and Mama’s Jerk, a powerhouse of Caribbean favourites. Wharf Kitchen will also be home to The Paleo Supply Co, a new concept from Protein Haus founder, Carli Wheatley, offering super healthy food on the go. Perfectly nestled among the popular shops and cafés in Canary Wharf, the indoor market enables foodie fanatics to mix up their lunchbreak or grab a bite whatever the weather. Open from breakfast through to dinner throughout the week, and seating up to 80 people, Wharf Kitchen will also play host to live music and DJs on Thursday and Friday evenings; so the perfect after-work spot for lively gatherings ahead of the weekend. In keeping with Canary Wharf’s Breaking The Plastic Habit initiative, all food packaging and cups used as part of Wharf Kitchen are compostable and go into a dedicated waste stream and turned into commercial compost. These steps are essential if Canary Wharf is to reach Plastic Free Community Status. Ahi Poké was born in 2016 after a trip to California. Enamoured with the relaxed, laid back atmosphere of the American west coast and the fresh and nutritious raw ingredients (and London’s innovative spirit) the team knew they needed to introduce London to Poké. Signature bowls include Oahu, a combination of rice, ahi tuna, onion and vegetables and Sweet Green, a mix of kale, miso tofu and sweet potato. The Athenian was founded by Efthymios and Neofytos, two Londoners born and raised in Athens and Cyprus. Ask any Greek and they will be sure to tell you that souvlaki is the nation’s favourite food to eat on the go. A quick, healthier alternative to fast food, it consists of a pita wrap filled with delicious Greek ingredients. At The Athenian you will find a variety of souvlaki and gyros options, from grilled meats to vegetarian as well as the signature vegan Gyros too. Born in Shoreditch in 2014, BIRD specialises in wings, burgers, fried chicken, waffles and their famous waffle burgers. The chicken comes from a single, family-run farm on the Yorkshire Wolds, delivered fresh every day. It’s brined in buttermilk, tossed in secret (gluten free) spice mix and fried in 100% British rapeseed oil, fresh to order. All fried chicken is 100% halal. Mama’s Jerk is an innovative Caribbean street food company serving authentic tasting home cooked Jamaican cuisine. Over the years Mama’s Jerk have been famed for fiery and succulent jerk chicken, however the simple menu offering also serves Jamaican inspired vegetarian, vegan and fish options, alongside fresh tropical salads, innovative rice dishes, handmade roti wraps and healthy fair-trade beverages. The Paleo Supply Co provides the healthiest of foods, designed to work in conjunction with your lifestyle and metabolism. Their grab-and-go meals and personalised meal plans are designed to help you lose weight, lean up and feel more energised. Sourcing only the best, The Paleo Supply Co consist of mostly organic ingredients and is gluten free – offering a range of all-day eats. Rainbo is all about fast food done properly. Behind every dish served is a focus on food that is fresh, vibrant, exciting and delicious. Rainbo started life in 2012 as a food truck specialising in gyoza dumplings but as the business has grown, so has the menu. Expect all sorts of Japanese delicacies with a unique twist – from katsu wraps, pork belly rice bowls and teriyaki pulled oyster mushrooms, to their famous breakfast bao buns and of course the signature gyoza. The Vurger Co. exists to create a revolution in fast food, highlighting the very best vegetables, seeds, nuts and legumes all, combined to create the indulgent burger of the future. Locally sourced wherever possible, totally natural, simple, wholesome and delicious, The Vurger Co. lovingly craft these ingredients into one of the most accessible and informal dishes the world has ever known – the burger.